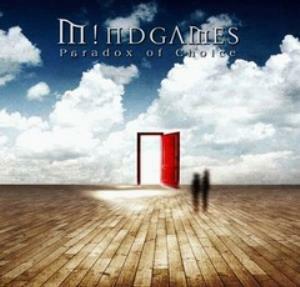 I've followed the Belgian progressive rock act Mindgames more or less since their debut album, International Daylight, from 2002. At the time, I was pleasantly surprised that they did NOT play prog metal (which I somehow expected due to the name starting with 'mind') and that they had jazz-rock influences in their sound. Over the years, it appears that they've shed the jazz-rock in their sound (a pity) even though I still have to listen their third CD MMX (see review) from 2010. On MMX the band presented a new bass player, Maximillian von Wüllerstorff. Also, the new album Paradox Of Choice brings a new member: Sandro Starita playing electric, rhythm and acoustic guitars and mandolin. The others have been in Mindgames ever since the start: singer Bart Schram, keyboard player Tom Truyers and drummer Benny Petak. Musically we find the band playing neo progressive rock on the heavier side of the spectrum. After the short spoken Prologue (I believe a quote of quality management guru W. Edward Deming) we launch right in with The Whistle Blower. The sound reminds me pleasantly of some 1990s neo prog groups. Arena pops to mind, but also and especially IQ (post-Ever) is clearly an inspiration. One thing that stands out are the strong vocals (even if they are at the edge of their range sometimes) coupled to good songs and good musicianship. This we can hear in The Age Of Plenty which is the first long track, that takes all the qualities from the previous piece and stretches them over double the time, adding a dreamy, almost meditative ending. The next track Out Of Sight has an acoustic start from which piano and keyboards emerge. Later we get a wonderful soaring guitar solo (a bit Pink Floyd like, but different). The following piece Revenge Of The Wizard takes a highly theatrical turn and almost reminds me of operetta. While amusing I find it one of the rare weaker moments of the disc because I know that this is going to be annoying over repeated listening. But, still there is some nice slightly dissonant instrumental work in there. Requiem For A Dancing World is another longer piece that clearly draws on symphonic bombast and reminds me of something that I can't put my finger on. Halfway through there is a change of scenery where the band briefly toys with African influences (at least that's what it sounds like) and launches into a fast-paced instrumental part that would do very well in a chase-sequence in an action movie. I love the old-fashioned sounding lead-synthesizers in this track, by the way. Then the track explodes in a climax that picks up the theme from the start (is it Pendragon? maybe Arena?). Context? Anyone? is the shortest track. Again there is an acoustic start and then a pleasant melodic neo prog track. The Sands Of Time starts with great soaring guitar and piano before picking up a filmic direction (a bit of Bond-theme there, maybe?). Somehow the song regrettably doesn't manage to keep my attention, but luckily there is closer From A Drone's Perspective. This starts bombastic then suddenly we are surprised with funky guitar and some elements that come interestingly close to disco! A bombastic finale provides a fine ending for both this track and the CD. Another very fine album. As far as I'm concerned, Mindgames' best so far!